StormRanger 7 in Tierrasanta on Friday, February 17, 2017. 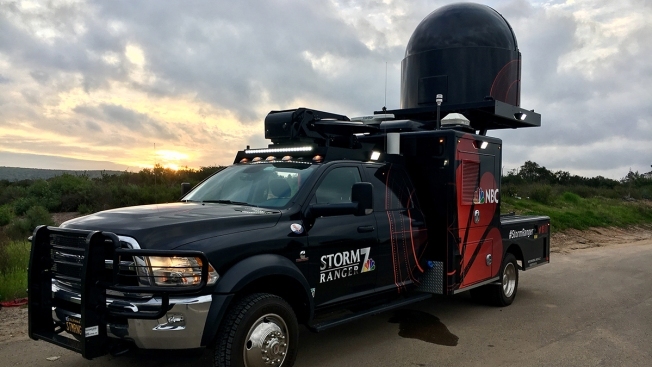 Our exclusive StormRanger mobile radar truck is a one-of-a-kind vehicle that has a live, high-powered Doppler Radar on board that enables StormRanger to get out ahead of a storm. The StormRanger can track storms wherever they are with a higher degree of accuracy and with more detail than ever before. When StormRanger's powerful radar is turned on and tracking storms, you can access its feed on all of our digital platforms in the Live Radar layer (The blue icons on the radar screen indicate local, fixed Doppler radars. Black icons indicate StormRangers, NBC's exclusive mobile Doppler radars). 1. How can I access the Live Radar? You can access the Live Radar in our iOS app or the weather section on our desktop and mobile sites. To change layers, click on icon at the bottom right that looks like three sheets of paper stacked on top of one another, select your desired layer, then click "close"
2. How can I see other NBC radars? Zoom out to view the entire U.S. map, and you will be able to see all radars in the NBC Radar Network. You can click on any radar and you will be zoomed into that region. 3. When will I see the sweep from my local radar? Zoom in so that the entire area in view is within the radar area. The sweep has a defined range, so, if you have zoomed out too far the sweep will disappear. When this happens, you’ll notice that the radar header at the top of the screen changes.